Pre-washed white cotton t-shirt; cardboard; red and blue acrylic paint; 1/2" wide, flat paint brush. Insert cardboard inside shirt to keep paint from seeping through. 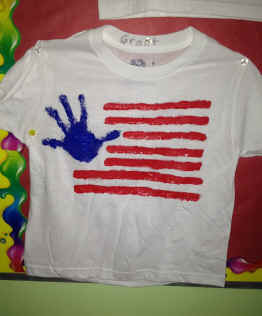 Dip child's palm of hand with fingers spread apart, into blue paint and then press onto the shirt to represent a "star." Paint 7 red stripes on shirt. Allow to dry and wear it with pride!